Any port in an Ion Storm? The Scottish National Party is backing suggestions that Lossiemouth in Moray becomes Britain's first space port. With Virgin Galactic confirming that they are looking seriously at three British launch sites – including Lossiemouth, Machrihanish in Argyll and an airbase in south-west England - the competition to become a space port is hotting up. However, the SNP is keen that it be a Scottish destination that gains the prestige of becoming the first spaceport. "The prospect of space flight from Scotland is a serious and exciting one," said Angus Robertson – the local SNP MP and Westminster representative for the party. "Other countries are keen to be at the front of the queue and I would like to see Moray remain front-runner. "It would be a mistake to underestimate the tremendous potential of these flights, which will probably also launch satellites into orbit as well as offering tourist flights into near-Earth orbit." 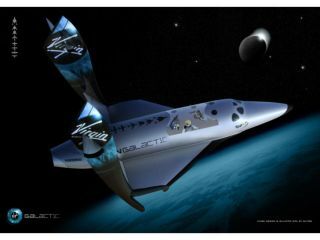 Virgin Galactic's proposal to offer sub-orbital space flights to the paying general public has garnered massive publicity, with orbital flights also on the timeline. "Virgin Galactic proposals are an iconic and inspirational opportunity, which would bring technology investment, jobs and tourism, as well as science and educational opportunities," added Robertson.